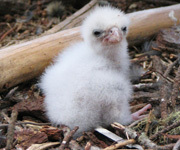 Why we breed New Zealand falcons for release. Alongside our education and advocacy work we are also compensating for the threats to falcons by releasing captive reared falcons into the wild. The Karearea, New Zealand falcon faces many threats in the wild. 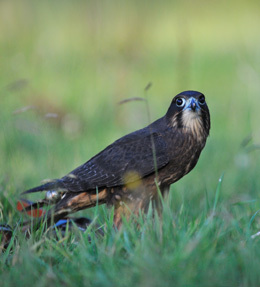 Together these threats severely impact the survival and breeding success of falcons nationwide and have led to the New Zealand falcon being classified as threatened with the risk of extinction. Wingspan is working hard trying to reduce these threats through education and advocacy. This requires large-scale changes in attitude and in the way we manage our environment, and takes time. In the meantime more immediate hands-on action is required and that is where our team of skilled ‘falcon breeders’ comes in. 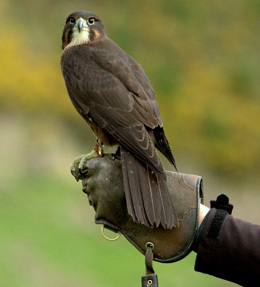 Wingspan compensates for the threats to falcons by releasing captive reared falcons into the wild. In some areas this means re-establishing locally extinct populations, in others supplementing declining numbers. Our Captive breeding and release programme. Captive pairs of falcons have been established at Wingspan from birds that were handed in injured (mostly shot) but could not be rehabilitated and released back into the wild. 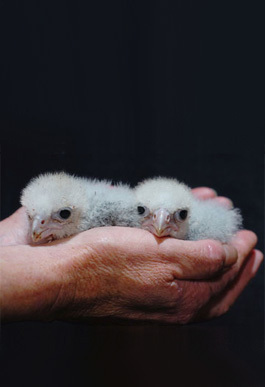 Once paired up and breeding, there are a variety of management techniques that the breeding team employ to encourage the successful production of falcon chicks for release. After the female has laid her eggs the pair is left to rear the chicks themselves or the eggs are ‘pulled’ and hatched artificially in an incubator. Eggs are pulled if the falcon pair are known to be poor parents or if the Wingspan team decides they want to encourage the pair to lay another clutch of eggs. Encouraging a pair to lay two sets of eggs in a season is known as ‘double clutching’. When the eggs have hatched in the incubator the chicks are either returned to be raised by the parents, placed under ‘foster’ parents or hand-raised by our expert team. Once the chicks have reached around 25 days old they are transported to a suitable release site and placed into a release box known as a ‘hack box’. They remain in the hack box for up to two weeks. During this time they imprint on the area that they can see from the box and come to recognise the area as ‘home’. Once released the chicks slowly learn to fly and hunt. Without their parents to teach them this can be a long process and is very nerve wracking as they spend lots of time on the ground soon after release making them vulnerable to predators. Eventually they become independent and disperse to join the wild breeding population.